The holiday season is upon us. Lights have just started to go up in my neighborhood and I saw a few festive window displays this morning on Via Condotti and Via Babuino. I haven’t seen any panettone movie commercials. Several friends have assured me they are coming. Excellent. One of my goals for 2014 is to entertain more. Yes, I know it’s a little early to think about these things. I can’t help it. My apartment is small but I had a friend, Susan, in New York City who lived in a studio that was smaller than my place and yet she had dinner parties, Oscar parties, cocktail parties, let me introduce you to my new spinning teacher parties, etc. Her space had a different layout. However, I can still be inspired by many of her fantastic ideas. My mom, like Susan, has a great selection of serving trays and platters. Some she received as wedding gifts fifty years ago. I actually enjoyed setting the dining room table when my parents had dinner parties. My mom was occupied with cooking, my dad was the bartender, and us kids were “in charge” of the table. Okay, so my mom really had the last word about what was going on the table. When I was old enough, it was my job to iron the tablecloth and the napkins. While I STRONGLY dislike ironing my sheets (it takes forever), this party prep was fine with me. The last time I was in St. Martin, one of my friends (and former boss) was on the island and stopped by for a visit. I looked through my parents’ collection to find the right tray for aperitivi and thought about all the fun holiday dinners and parties. I also realized that I need to step up my platter game. This one is gorgeous. It’s from Williams-Sonoma and made in Umbria. This shade of blue is one of my favorites. 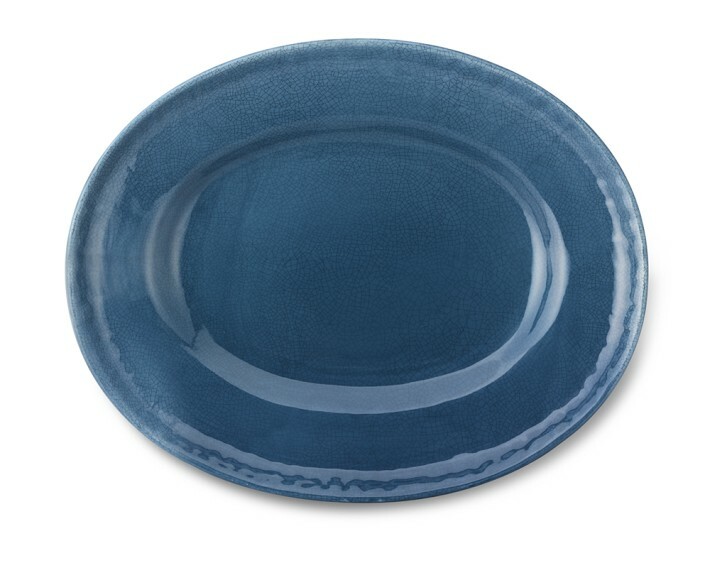 This platter is stylish simplicity. Thanks for the shout out. When you get as old as I am you are happy to be alive, happy to be remembered and happy to be called friend. I love you. You’re welcome. You are not old! Love you too.